On 28th November Tim Clarke was announced as the winner of this year’s N E Rowe Award at the Royal Aeronautical Society Medals and Awards Event held in London. 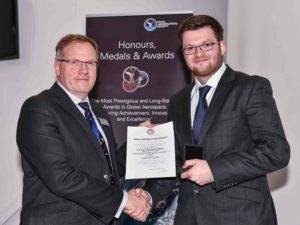 Tim was an Industry Placement Student with QinetiQ here at Boscombe Down over 2015 to 2016 academic year, during which he won the Boscombe Down Joe Morrall Award with his paper and presentation on Adaptive Muzzle Breaks – Managing and Mitigating Firearm Recoil (which has benefits for military aircraft). The Branch put forward this paper as an entry to the RAeS national competition and we are delighted that someone who has been a member of the branch and QinetiQ has won. The picture shows Tim receiving his award from Prof Chris Atkin president of the RAeS.